The night of January 16th, 2017, 482 hives were stolen from a bee yard in Sutter County. All the equipment (including pallets) is brand new and has no brand numbers. The hives are double-deep 8 framers with grey cedar lids on 4-way pallets. Pallets are an odd size: 28.5 x 46″. This configuration is fairly unique. Please contact the CSBA with any tips. The CSBA once again participated this year with a booth at the Annual Almond Conference in Sacramento, held December 6-8th. 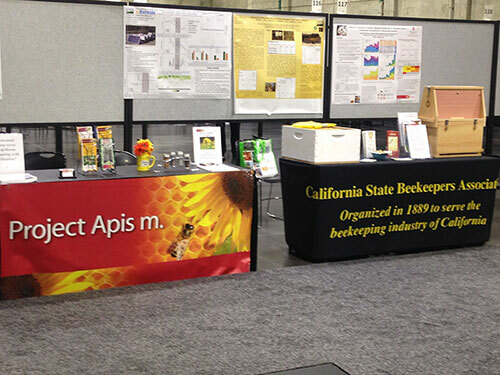 A huge “thanks” was given from the Almond Board Staff for our booth presentation and live observation hive. The observation hive was a big draw and topic of many conversations. We have made significant progress in the development of a Varroa mite biocontrol strategy.Over the last 10 months we have successfully developed methodologies for isolation, genetic characterization, and toxicity assays (in vitro and host-associated) of candidate Bacillus thuringiensis (BT) strains.